You might’ve heard: football season is back. You might not have heard: you can take over an entire SoCal stadium to play your own game in front of 70,000 fans. Or just a couple of grounds crew workers. 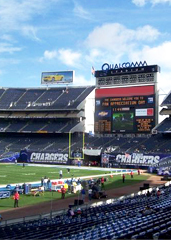 Let’s take a moment to discuss Qualcomm Stadium Rental, your chance to upgrade the location of your touch football match from the park to the San Diego Chargers’ spacious home, available now. So if you just want to arrange a casual little gridiron battle for you and your burliest friends in a cavernous NFL stadium, they can do that. But if you want to bring in the caterers for a massive postgame feast on the field (you’re thinking only the finest pretzels and beer), they can make that happen, too. Getting Norv Turner to show up will be extra.